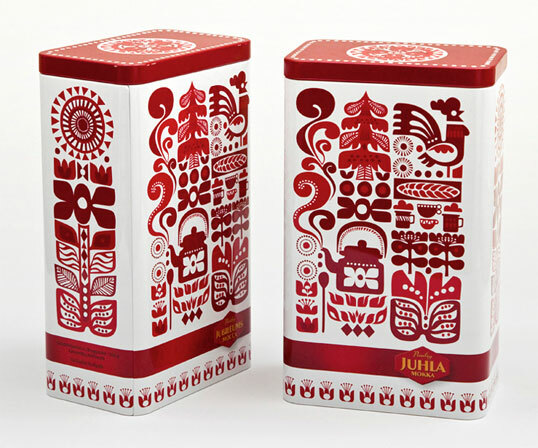 Special edition tin for Finnish coffee brand Paulig. These nordic designs are amazing, tough used too much. I’ve seen these patterns lately so much, that they loose their unique touch. Seen for itself, this product is a great design, but seen in comparison to many other products with that patterns nothing special. .. sad..
Where can I get these special edition coffee tins in Toronto, Canada…is it even available here? This tin is really, I mean, REALLY nice. It so nicely fits my kitchen design and it is quite convenient to store coffee. It is really funny that I find this picture here. In the fact, this tin box was made by us-Fancy Pack Co.,Ltd. Handled by me. It is simple tin box , but because of your design, it looks very nice. I think some other designs also from your hand for the tin box for paulig.